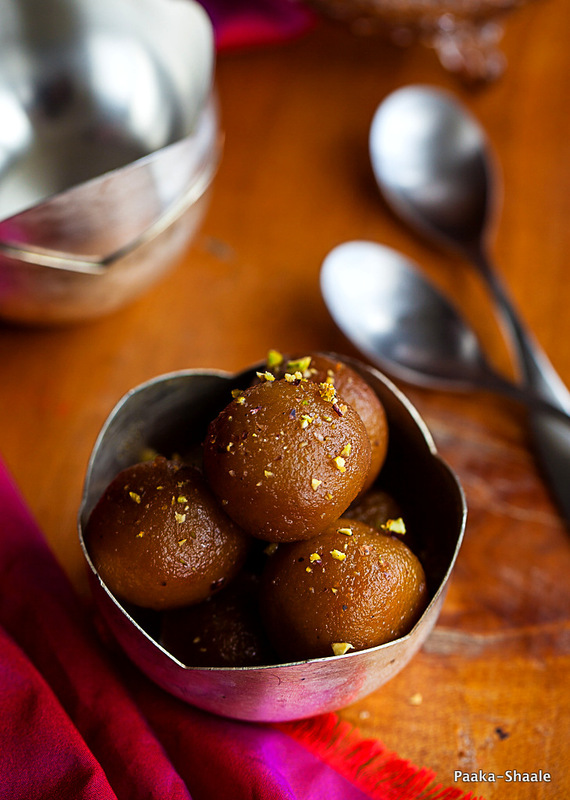 Gulab jamun is perhaps one of the most popular among Indian mithais. A sweet treat that can be gulped down in one bite. Traditionally this sweet dish is made out of khoya or hariyali mawa (milk solids). The milk solids are shaped into delicate balls and deep fried. 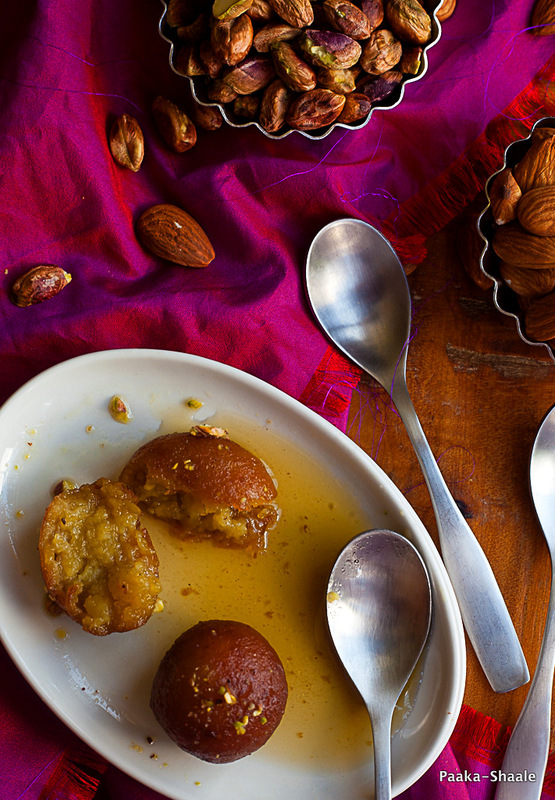 These deep fried balls are then dunked into cardamom and saffron scented sugar syrup. 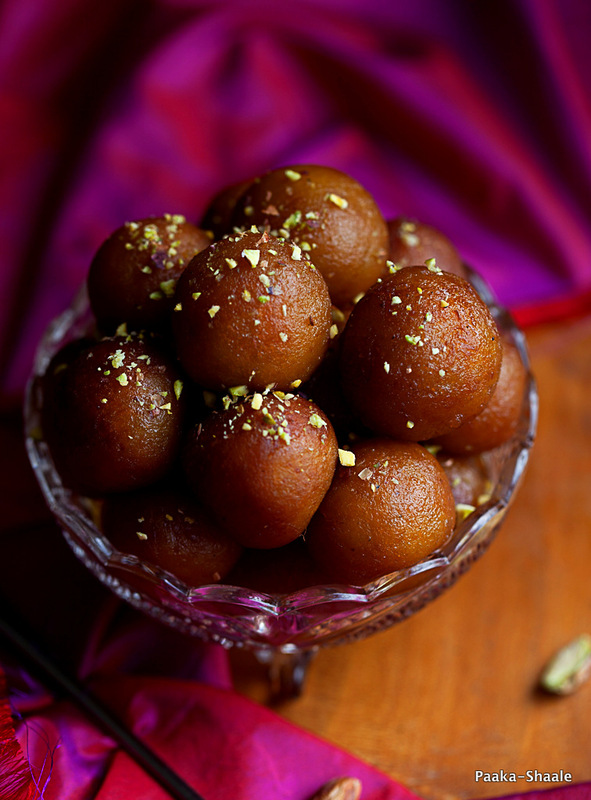 Gulab jamun made this way are extremely delicious, luscious. Each bite into these succulent balls can transport you into a state of pure bliss. The downside of making gulab Jamun using milk solids is that that it requires a lot of skill and a little prep work. Since most people do not have that kind of time and skill, they mostly resort to ready made mixes. So if you are looking for a recipe for gulab Jamun that is easy to make, Vegan and as tasty as the traditional Gulab jamun, then your search has come to an end. I am sharing the Sweet Potato and almond gulab jamun which comes very close to the traditional gulab jamun in taste and texture. 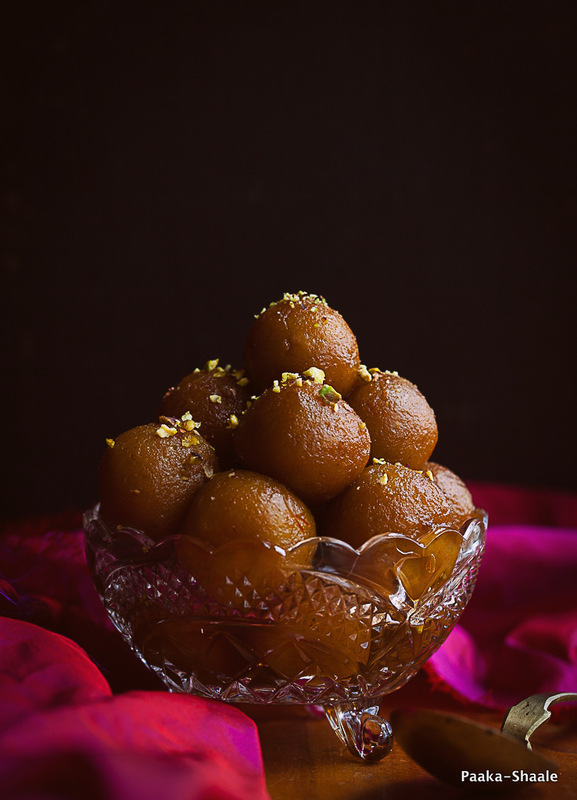 This version of Gulab jamun is relatively easy to put together and does not require the kind of expertise that you require to make the traditional ones. 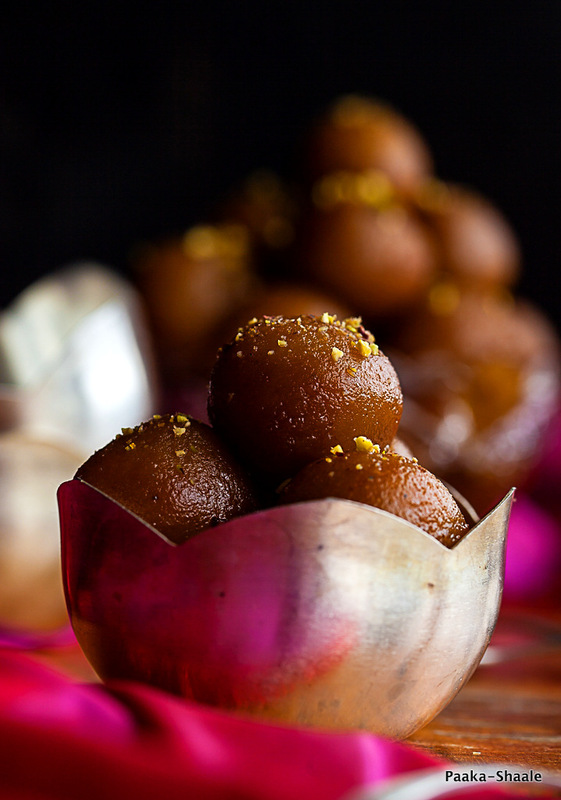 And to top of all of these, these gulab Jamuns are healthy and packed with nutrition. These Syrup soaked sweet potato balls are delicious and has a rich mouth feel and intense flavor!! I had heard and read about sweet potato gulab jamuns. But I was a little skeptical about the taste. But now that I have tried it, I will definitely be making this again and again. I actually wanted to add khoya or milk powder as the original recipe had mentioned. Since I did not have either of them, I decided to make this dessert with just sweet potatoes and almond meal. Despite the omission of khoya, the Gulab jamun actually turned out great!! They were incredibly soft and had a melt in the mouth texture. 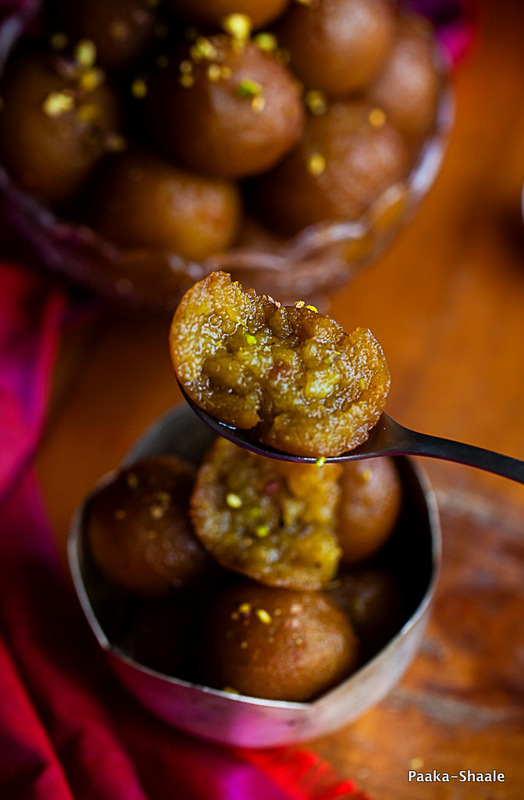 These Gulab jamuns are a great way to pamper yourself without feeling guilty. Wash and scrub the sweet potatoes to remove all the dirt. Place the sweet potatoes in the pressure cooker and add enough water so that the potatoes are covered. Place the lid and weight and pressure cook the potatoes for two whistles. Allow the steam to dissipate itself completely before opening the cooker. Remove the potatoes from the cooker and allow them to cool completely. Peel the potatoes and mash them thoroughly with your hands. Add the almond meal, All purpose flour, cardamom powder and baking soda and knead to make a soft dough and keep aside. To make the Sugar syrup, Mix the sugar and water in a sauce pan, add the saffron threads and cardamom powder and bring to a boil. Reduce the heat and allow the mixture to simmer for a 5-10 mins. or until the syrup turns thick and reaches half string consistency. Take off the heat and keep the syrup warm. Grease some ghee or oil on your palms. Pinch small lime sized balls from the dough and shape them into smooth balls. Make sure that the balls do not have any cracks. Heat oil in a thick bottomed wok. Once the oil is hot enough, carefully place the prepared sweet potato balls in a single layer. Avoid crowding oil with too many Gulab jamuns. Fry the jamuns in low-medium heat until they are cooked through and golden brown in color from all the sides. Remove the fried jamuns carefully with a slotted spatula, drain and dunk them in warm sugar syrup. Allow the jamuns to soak the syrup for at least 30mins to an hour before serving. Garnish with nuts and serve warm. Or, serve warm with Vanilla ice-cream. Make sure there are no lumps when mashing the sweet potatoes. 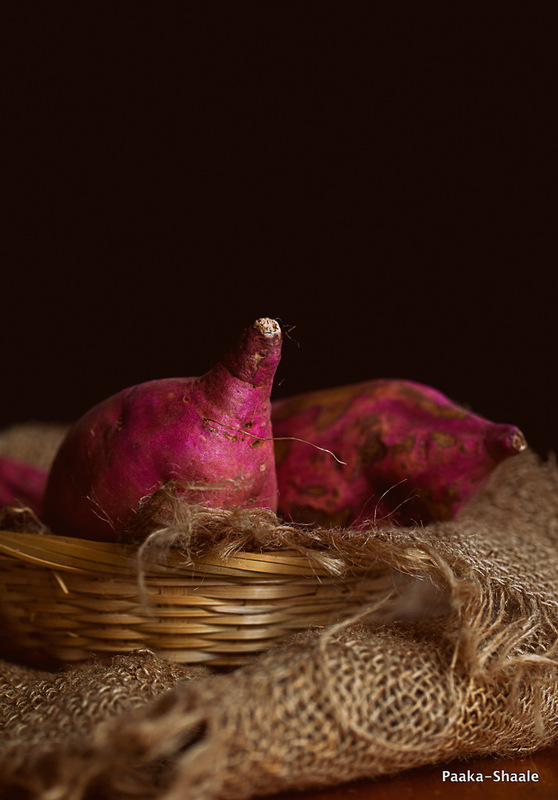 You can try passing the sweet potatoes through a fine sieve to remove any fibers or lumps. You can also try running the boiled sweet potatoes in a blender until smooth. You can replace the almond meal with equal quantity of Khoya/ milk solids or milk powder. For a different flavor, you can replace half of the almond meal with unsweetened coconut. When frying the jamuns, make sure the oil is not smoking hot. The oil should neither be too hot or too cold. To know if the oil is hot enough, drop a small piece of the dough in the oil. You know the temperature is just right when the dough sizzles and slowly rises to the surface. To make the Almond meal, blanch half cup of almonds in hot water. Peel the skin and set aside to dry for a few hours. Once dry, grind them to a fine meal and use as required. You might notice the sweet potato flavor if you consume these jamuns immediately. Just allow these jamuns to rest for for 6-7hrs or overnight and you will find that they would have acquired a richer flavor. This dessert stays fresh for a couple of weeks if refrigerated. I don't think I've ever eaten this sweet, but it looks amazing. 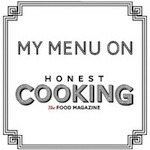 Your photos are gorgeous and very enticing to give the recipe a try.